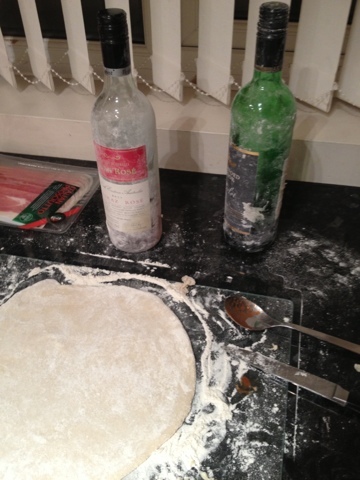 Mummy, Wife and Chaos: Rolling pin! My rolling pin.... I was connected to it, it was as old as me and handed down from my mum. I remember using the very rolling pin when I was my children's age. So it was traumatising when the said rolling pin had its final roll. Off my table. You see it was no ordinary rolling pin. It was a big lovely ceramic white one and I could even fill it with water to make it heavy. Now I realise I could quite possibly track a exact copy of my loss on the high street but that's not the same. Although I would be interested if anyone knows where! I do however need to most definitely replace it now as a matter or urgency as pizza night in our house has been interesting the last few weeks. Yes it's been weeks! The thing is my "coping strategy" worked so I continued with it. However my latest tools are now unusable. Although its probably cheaper, they are far to tempting! 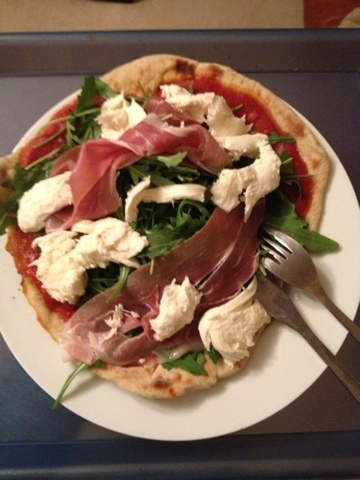 I do however whip up a very yummy quick pizza with thanks to Jamie Oliver's 30 minute cookbook! The book is great if like me you like to pick up bits and bobs rather than always sticking to a plan. That's me all over though... Everything my way!